Majority Leader Mitch McConnell and Senate Republicans hardly could have done more last year to help President Donald Trump reshape the nation’s federal courts with conservative appointees. They put Justice Neil Gorsuch in a Supreme Court seat, one they blocked Barack Obama from filling during his last year in the White House. 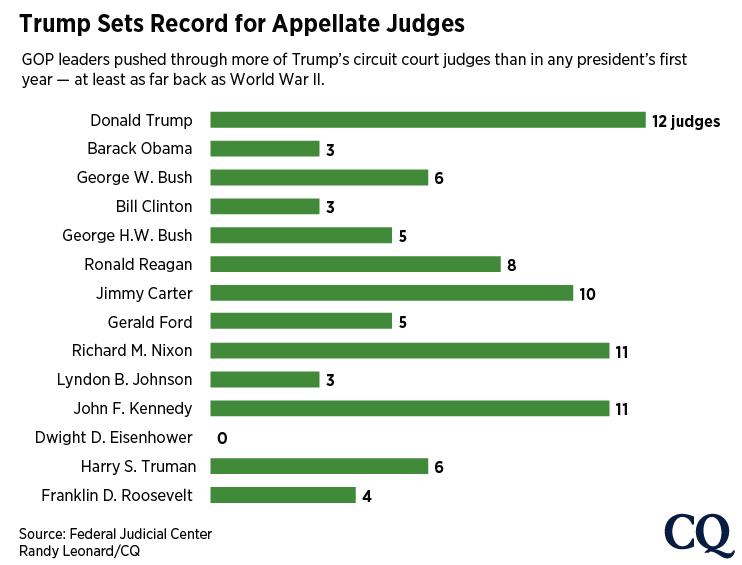 Then they approved a dozen Trump picks for the influential appeals courts that have the final say on the vast majority of the nation’s legal disputes — a record number for a president’s first year in office. Against the backdrop of an otherwise lackluster year of legislation and an onslaught of political drama from the West Wing and Trump’s Twitter feed, somehow the long-dysfunctional judicial confirmation process emerged as a relatively functional part of Washington. But to help Trump accomplish that feat, the White House and Senate Republicans further changed the game on confirmations. They brushed aside or relaxed long-standing customs meant to give senators more say — and more sway — in who gets lifetime tenure as a federal judge. And Senate Republicans start 2018 intent on further streamlining the process to fill more than 120 vacancies on federal district courts. What happens next in judicial confirmations will reveal not only Trump’s ability to leave a lasting imprint on the nation’s courts, but how much the Senate asserts itself in its “advice and consent” role — particularly when the same party controls both the Senate and the White House. Senators have complained that the White House isn’t adequately consulting with them on whom to nominate, decried that Senate Republicans are ignoring negative candidate evaluations from the American Bar Association and criticized a faster than normal pace of hearings in committee that gives senators less time to question nominees and research their background. Democrats on the Senate Judiciary Committee already warn that the Republican rush to fill the courts has ceded power to the president, and turned the 21-member committee into a rubber stamp for a run of unqualified and partisan judges. It’s safe to say that Democrats, if they retake control of the Senate in the midterm elections, would boldly reassert the legislative branch’s role — largely by revoking its consent. Some key Republicans — Chairman Charles E. Grassley of Iowa, a believer in the Senate’s institutional prerogative and, surprisingly, first-term Sen. John Kennedy of Louisiana — found a voice late in 2017 and pushed back against the White House. Three of Trump’s picks withdrew after Senate Republicans stood their ground, establishing an outer bound of deference to the president’s picks. But it will be hard to clamp down a firehose of pressure to flood the courts with Trump nominees. And there are no signs McConnell and Senate Republicans want to slow down, even with a narrower majority in 2018. White House Counsel Donald McGahn exuded swagger and peppered jokes throughout his address to the annual gathering of the libertarian-leaning Federalist Society in Washington in November. And why not? The group, a decades-old fraternity of sorts for conservative legal thinkers, rose into public view because it was behind Trump’s list of 21 potential Supreme Court nominees that he released during the 2016 campaign. Critics continue to say the Trump administration has “outsourced” judicial nominations to the group. “I’ve been a member of the Federalist Society since law school, and still am. Frankly it seems like it’s been insourced,” McGahn, who earned his law degree in 1994, said to laughter from the crowd. Days before the society met at the Mayflower Hotel a short walk from the White House, McConnell pushed four appeals court confirmations through the Senate floor in one week, amid pressure from outside groups that he wasn’t moving on them fast enough. Grassley was in the middle of cramming five other appeals court nominees through confirmation hearings that month, causing Democrats on the Judiciary Committee to howl that the pace outstripped the committee’s ability to properly vet nominees appointed to a lifetime position. “Chairman Grassley does not get enough credit for his work on this,” McGahn told the Federalist Society. The previous day, Grassley had announced he would relax the committee’s “blue slip” tradition — where a home-state senator needs to sign off on a blue piece of paper before the committee moves forward with a confirmation hearing. The chairman said then-Sen. Al Franken of Minnesota was using it as a de facto filibuster to block a nominee for political reasons. Grassley took to the Senate floor to say he would move forward with a confirmation hearing for an appeals court nominee even if a home-state senator objects — as long as the White House consulted with the senators from that state. He kept that blue slip tradition for district court nominees, but the move meant one more hurdle lifted between Trump’s picks and the courtroom. McGahn told the Federalist Society that the White House staff sought suggestions from home-state senators yet pointed out that Trump won’t be beholden to the custom of state-run selection panels for recommendations. Senators for years have used such panels to help control who gets picked from their state. Democratic senators have cited a lack of consultation from the Trump administration as a reason they haven’t given their blue slip approval to nominees. Such a showdown is brewing between Grassley and Oregon Democratic Sens. Ron Wyden and Jeff Merkley over a nominee for the U.S. Court of Appeals for the 9th Circuit, Assistant U.S. Attorney Ryan Bounds, who still awaits a confirmation hearing four months after his nomination. But McGahn said it is McConnell who really orchestrated the opportunity to reshape the courts with conservative judges by blocking Obama’s judicial picks and leaving Trump with a large number of judicial vacancies to fill. “He has made this his number one priority and he has delivered,” McGahn said, hinting that priority won’t change in 2018 when the administration expects to make even more nominations. The group’s spending could just as easily go toward negative ads for Republicans who stand in the way. While Democrats are powerless to stop confirmation votes, the election of Sen. Doug Jones of Alabama in December means the Republican advantage is now a slim 51-49. With the balance of power in the Senate at stake in the November elections, McConnell might move to confirm as many judges as possible. But even now, two Republican votes can’t be lost, which could prove a moderating force on who Trump nominates, says Josh Chafetz, a professor at Cornell Law School who wrote a book on Congress’ authority. Trump’s nominees have largely been the type that other Republican presidents might have nominated, thanks to the heavy influence of the Federalist Society, Chafetz says. But a few have been shot down because of a lack of experience or past public statements on social issues that went beyond what Republicans could tolerate. Still, Trump continues to press two district court nominees — Charles Goodwin for the Western District of Oklahoma and Holly Teeter for Kansas — who have been rated “not qualified” by the American Bar Association. 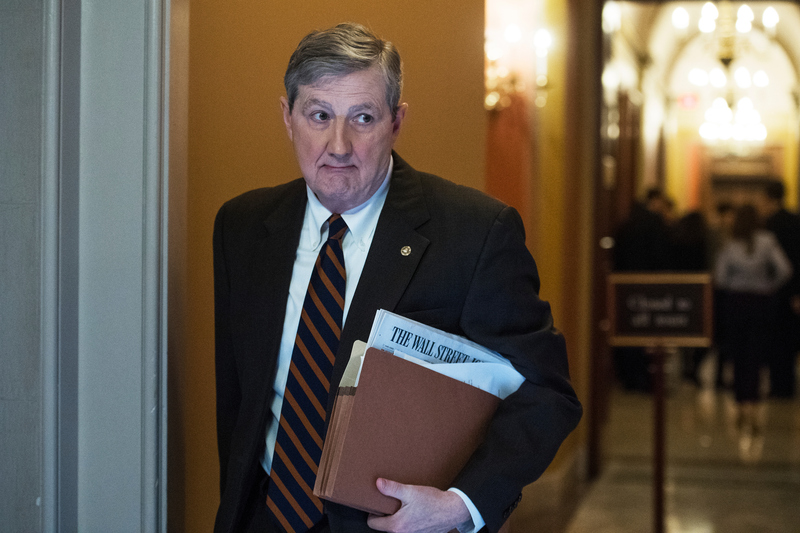 Kennedy, a former law professor and Louisiana state treasurer who backed Trump during the 2016 campaign, was an unlikely voice of opposition when he became the first Republican to vote against a Trump judicial nominee in November. In only his second year in the Senate, Kennedy felt the pressure from his longer-serving colleagues and elsewhere after the vote. It didn’t stop the confirmation of Gregory Katsas, a former White House lawyer, for a spot on the influential federal appeals court in Washington almost certain to decide numerous challenges to Trump policies on the environment, immigration and regulations with a national impact. Kennedy announced he would not vote for another Trump nominee, Brett Talley. And in a dramatic committee introduction for Washington-based lawyer Kyle Duncan, a nominee for the U.S. Court of Appeals for the 5th Circuit based in Louisiana, Kennedy voiced criticism for how the White House consulted with him. Instead of picking a lawyer practicing in Louisiana, McGahn in a call with Kennedy was “very firm that Mr. Duncan would be the nominee, to the point that he was on the scarce side, in one conversation, of being polite,” Kennedy said. He said McGahn apologized, and Kennedy eventually announced he would back Duncan’s nomination. In December, Kennedy administered a pop quiz of litigation basics to one of Trump’s district court nominees during a confirmation hearing. A video of the exchange with Matthew Petersen, Trump’s pick for the U.S. District Court for the District of Columbia, became a viral sensation on social media because of how badly he flubbed his answers. The exchange created such a stir that Petersen, a Federal Election Commission member and former counsel to the Senate Rules Committee, withdrew from consideration for the judgeship. Kennedy also told his colleagues during a committee meeting that he was going to vote his conscience — even if there are political threats. Still, the saga of other derailed judicial nominees late in 2017 raises questions about just how carefully the Trump administration is vetting its picks and whether changes in the confirmation process mean the Senate isn’t properly scrutinizing them either. The changes veteran senators Grassley and McConnell have made to streamline the confirmation process for Trump’s nominees might seem minor. But Democrats say they lower the process’ guardrails and risk trading the institution’s role for political expediency. “I am concerned about the steady erosion of this body’s norms and traditions, a body that used to be considered a conscious of the nation,” Sen. Patrick J. Leahy of Vermont, the longest-serving Democrat on Judiciary, told Grassley during a committee meeting. Leahy is outspoken in his criticism of Grassley’s change to the blue slip policy, which brought a pile of ire from Democrats because 18 of Obama’s picks were stymied using that tradition — including when Leahy himself maintained the practice for appeals court nominees when he was committee chairman. Committee Republicans also have de-emphasized the American Bar Association’s evaluation of judicial nominees, which Democrats say are an important tool and should be completed before holding a confirmation hearing. Since last May, a confirmation hearing featuring two appeals court nominees at the same time has been held four times, which Democrats argue splits a senator’s time for questions between two nominees. Republicans say more questions can still be asked in writing after the public session of questioning. On the floor, McConnell has twice sought to put a slate of appeals court nominees on the schedule within a day after the Judiciary Committee advances them, something Democrats say shortchanges senators who aren’t on the Judiciary Committee and haven’t had time to delve into the nominee’s background before being asked to vote on the floor. Amid all that, along came Talley, Trump’s pick for the Middle District of Alabama. He received a unanimous “not qualified” rating from the American Bar Association, had no trial experience, wrote a number of controversial blog posts and is just 36 years old. Talley was also criticized because he had failed to disclose a potential conflict of interest because his wife works in the White House. The Judiciary Committee had already advanced Talley’s nomination to the Senate floor on a party-line, 11-9 vote. Then online magazine Slate dug through posts Talley wrote on the University of Alabama fan message board TideFans.com — but had not disclosed to the committee — and reported that he aired opinions on controversial topics such as race and abortion. In one post, he defended the early Ku Klux Klan. 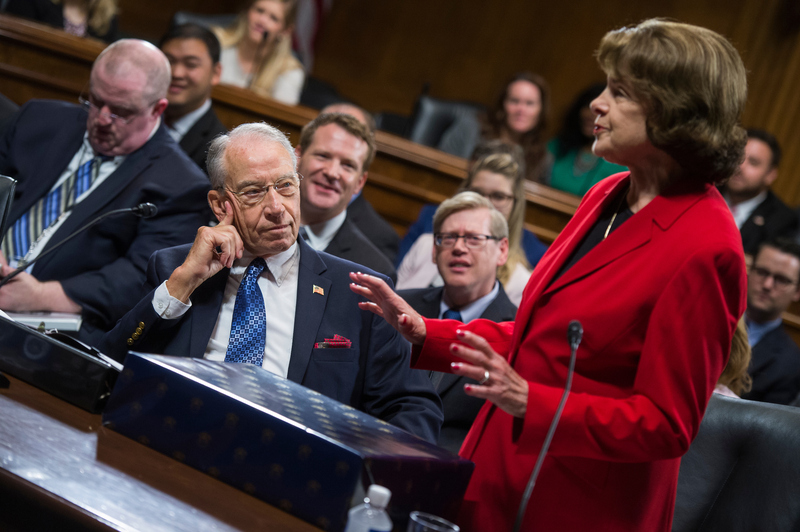 “This may not have happened if we had sufficient time and cooperation to fully review these nominees,” Feinstein said of Talley during a committee meeting. There’s still a logjam in the confirmation process: the time it takes to hold the votes on the floor necessary to overcome a filibuster. Senate rules require 30 hours of debate time after breaking a filibuster, which works out to only four nominees can be confirmed in a week. Oklahoma Republican Sen. James Lankford is pushing legislation (S.Res. 355) that would limit that debate time to only two hours for district court nominees — a standing order that was originally adopted by Democrats in January 2013 and ended in January 2015 with the end of the 113th Congress. Democrats can blame themselves for one streamlined process. Back in 2013, they also changed Senate rules to allow a simple majority to overcome Republican filibusters and move most judicial confirmations on the floor. Republicans changed the rules again last year so that a simple majority is only needed to advance a Supreme Court pick. Many of Trump’s judicial appointees won confirmation without needing to garner votes from Democrats. There’s a big advantage to the party in charge to constantly change the process when they see obstruction rise to intolerable levels, Chafetz says. The power of home-state senators on the selection of judicial nominees also would have lessened if Democrats controlled the White House and Senate, he tells CQ. Democratic Sen. Sheldon Whitehouse of Rhode Island says the heart of the “advice” part of the Senate’s constitutional duty is the knowledge on the part of the executive branch that the blue slip will be honored when it comes to district court nominees.